Cant Cove's official photographer is waiting for his latest colour photos. to be developed and printed; however, he also caught a “Sausage, Egg and Chips Special” for the special meal served at Trevelver Castle to thank everyone for their hard work during the terrible winter conditions. He also caught the Bullied BB Pacific and the WR Grange 4-6-0 passing through Cant Cove on their respective special trains which they had taken over at Wadebridge. Thank you very much for these super photographs, Martin. I'm glad that you had an agreeable operating session. 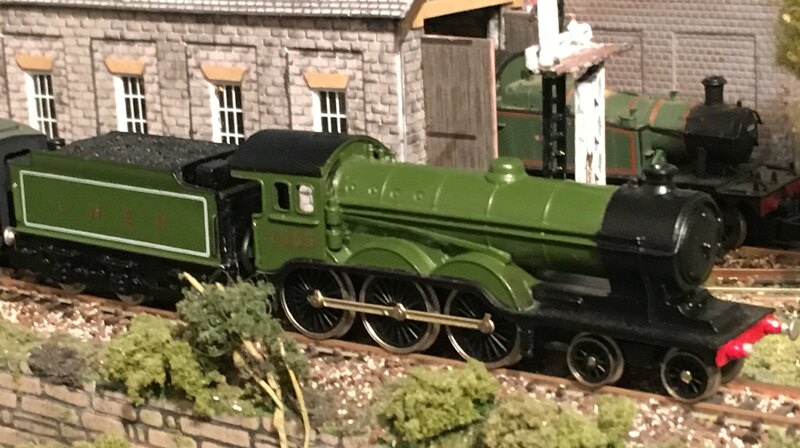 That's the appeal of model railways; one gets the fun of making the model and then the fun of playing with it. Fun2! 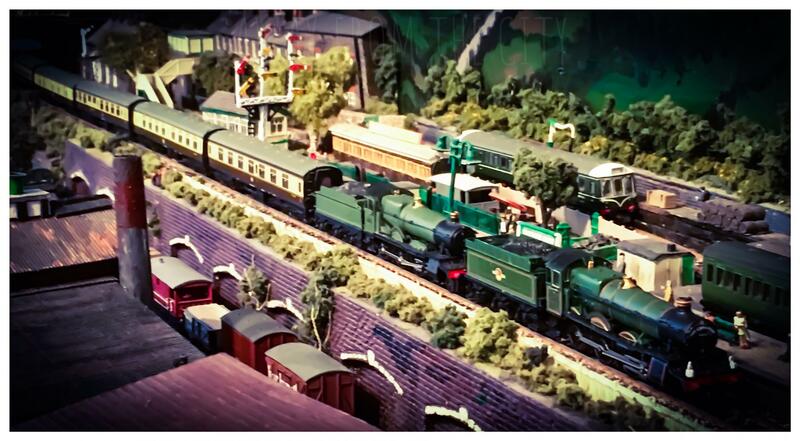 The GWR goods train looks splendid. I can almost replicate it passing Poppingham 30 or so years earlier. I can't post a photograph of it, though, as I'm getting a message saying that I've used my data limit (or somesuch computer-related phrase). Presumably something to do with the development work on the Forum. As for the omnibus on the overbridge...excellent! Thanks again and all the very best. Ah.....there is a limt on the number of photos one can place on the forum. It happened to me a while back. A simple personal message to tank asking for a bigger limit will slve the problem. I sent a message to @Tank and received a lovely reply. Thank you very much. The capacity situation has been very kindly resolved. 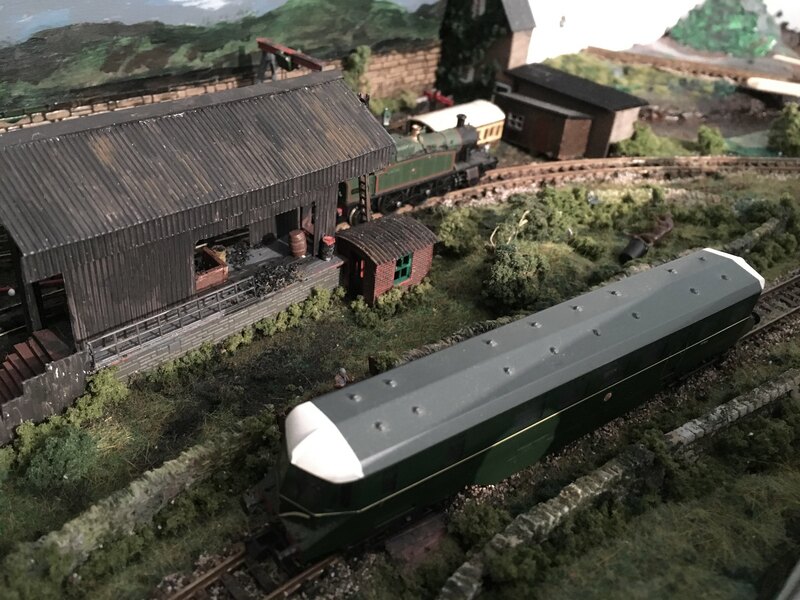 Here is the GWR goods train passing the Down sidings. Old Bill Dean believes on running to time, but he has managed to be almost thirty years early with this train! One cattle wagon was shunted out of the train at Exeter. The cattle in the other wagon have been regularly fed and watered. It's important that livestock is well cared for on a journey by rail. We are still on 'Southern and Friends' Rules at Poppingham. Of course, the Southern and GWR are normally on friendly terms, even to the extent of keeping train crews' route knowledge of the 'other' line up-to-date in South Devon. I’m glad that normal service has been resumed John. 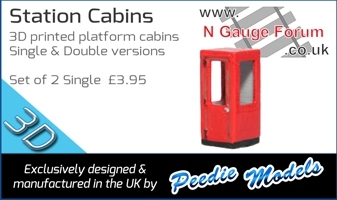 Due to the success of the preserved GWR goods train, a similar SR version is planned. 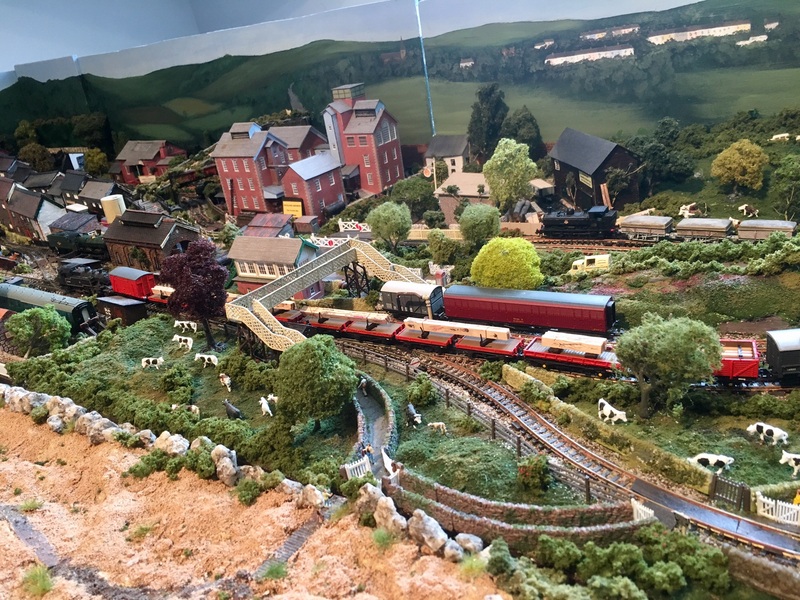 Just can't get enough of your layout, so much to see and so well presented. And following on from the success of yesterday’s ex GW demonstration freight, today it was the turn of the SR demonstration train seen heading towards Trepol Bay heading in the direction of Truro. Unfortunately, the restored T9 which was rostered to this working was failed earlier this morning and was replaced by34066 Spitfire. 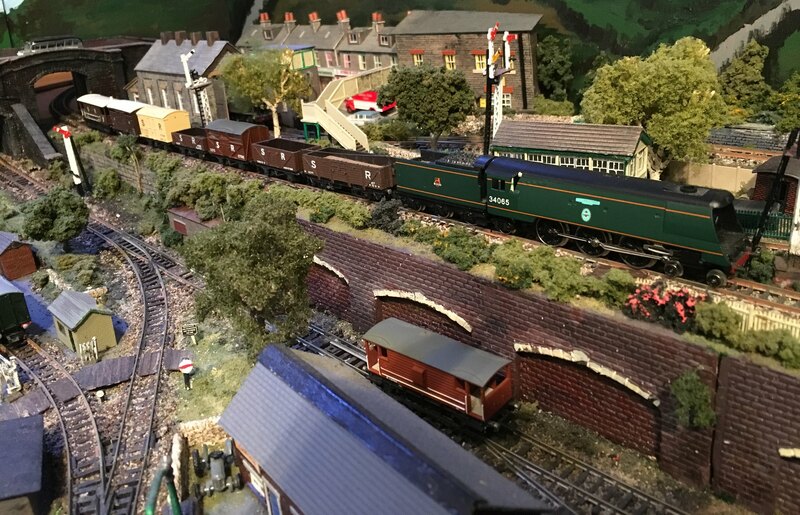 On seeing these two photographs, I have realised that on setting up the layout again yesterday (after our guests had departed) I forgot to fit the little tunnel extensions at either end. Hence, it is possible to see into the tunnels, a situation now rectified. Next a most unusual working as we see a Standard Class 5 heading towards Wadebridge with a train formed entirely of restaurant cars and buffet cars. The train originated at Penzance (Sloper’s Siding) but the destination is, at this stage, unknown. Note the ex GW railcar at Platform two waiting to form the 15.35 to Wadebridge and Penmayne. The GW railcar seen again, some 40 minutes later passing Wadebridge depot. The strange light effect on the side of the railcar is caused by the hole on the side of the boxfile which used to house the box locking mechanism. I must fill that in. Many thanks for these super-duper photographs, Martin. I'm wondering if there is a time tunnel between Trepol Bay and Poppingham, as the SR goods train was photographed here over quarter of a century earlier. Clearly, with Mr OVS Bulleid still being on the LNER with Mr HN Gresley, the time warp had to do something about the 'Light Pacific'. By the way, the 'Locospotter' in me, whilst not wishing to contradict you, thinks it is Hurricane, rather than Spitfire'. I think the substitution of venerable 'Adams' '0395' 0-6-0 No. 3441 for the 4-6-2 on this light goods train is fair enough. Thank you John and for that lovely photograph. Indeed, I do believe that the time tinnel does indeed exist. And yes, I have both Hurricane and Spitfire and simply got my two renowned fighters muddled. I see that Flossie has assumed a somewhat safer position on the grassy bank next to the track. A beautifully clear, crisp photograph which shows those trees to pleasing effect. I’m frequently tempted to run long trains and jolly nice it is to see them rumble past Trepol Bay station. However, Trepol Bay is on a quiet single line twixt Newquay and Wadebridge. 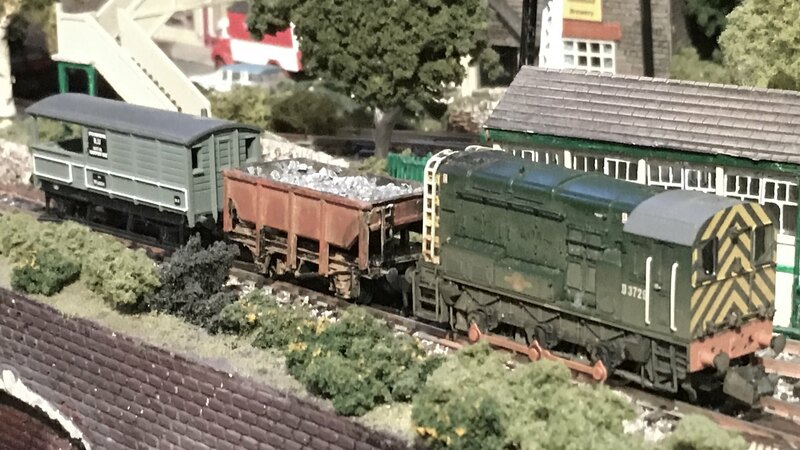 Typically it sees two carriage locals and short pick up goods trains so this evening I set about replicating a couple of typical examples. First an 08 shunter wanders past the signal box from the Wadebridge direction with a hopper of spent ballast. It appears that the local shop is receiving its daily delivery of Mother’s Pride. 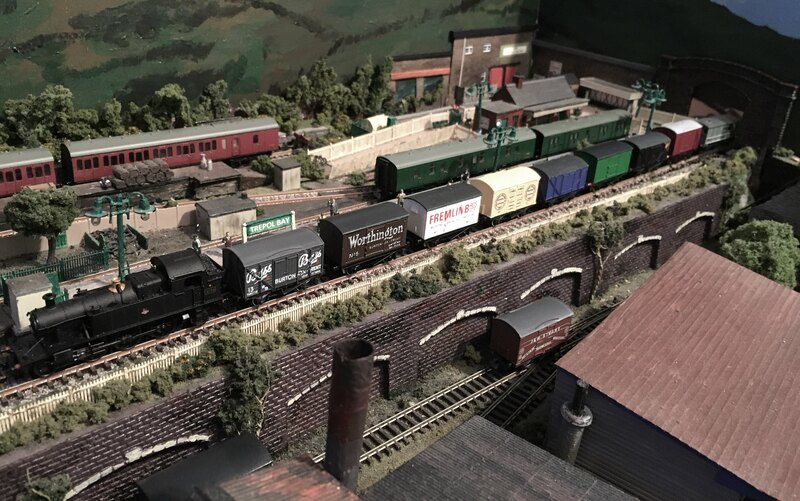 Just a trifle later an Ivatt 2-6-2T is photographed passing the little shed building with the afternoon pick up goods. Double decker omnibuses are rare in the area but the top deck does afford the passengers an excellent view of the harbour. 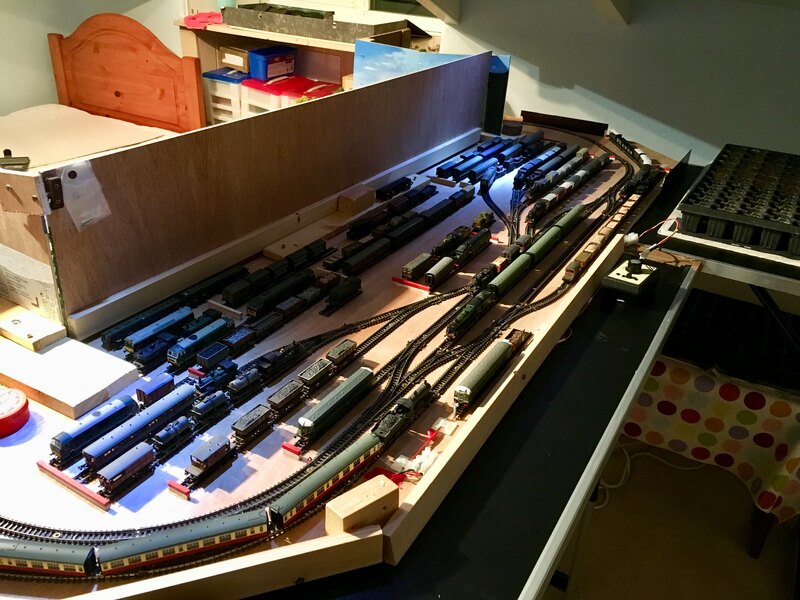 Finally, a little “behind the scenes” peep at the Trepol Bay fiddle yard with various trains chomping at the bit for a run around the layout. The seed tray contains onion seeds just germinating. We have a little storage heater just behind which keeps the seeds at an ideal temperature to aid germination. It’s about time I put up a photo of Port Perran again. An Ivatt 2-6-2T threads its way towards the station and on to Truro with a freight from the Port Perran Timber Merchant’s yard. It’s always good to see interesting and rare locomotive types making an appearance away from their usual haunts and this is a fine example from those splendid folk at Union Mills on the Isle of Man. 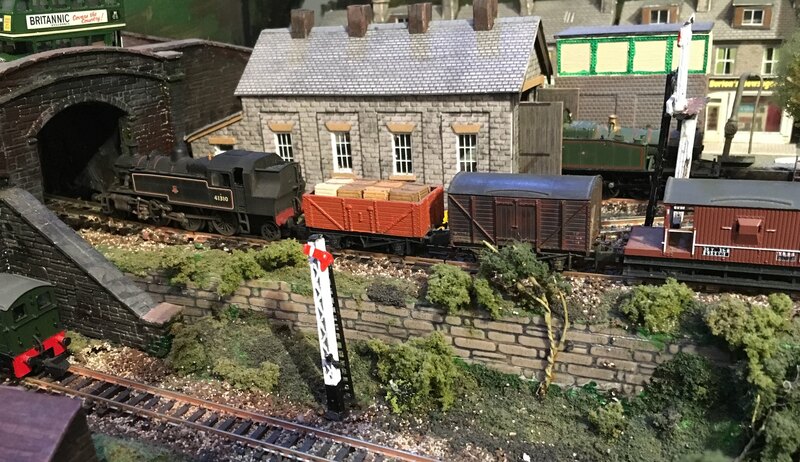 A special train wends its way towards Trepol Bay station past the tiny locomotive depot which is home to more familiar locomotive power in the form of a 45xx prarie tank. What a splendid sight this NE interloper makes. That's an excellent photograph of a lovely engine, Martin. The 'B12/3' is in absolutely super, sparking condition and a credit to those who are looking after her 'down country'*. I should think that the workings of that Westinghouse pump will have them scratching their heads a bit, though! * Is 'down country' permissible as the counterparty to 'up country'? Very good to see some new photos. of Port Perran, Martin. I particularly like the first one of the train in the landscape. The LNER loco. is always an attractive visitor. I plan to add a late model 57xx (not with the round cab windows) in BR Black Late Crest livery, like yours, in the future. Good time for me, Martin. There's so much to learn from such a photograph. I'm printing it for a ready reference as I work on my scenery. Page created in 0.178 seconds with 41 queries.